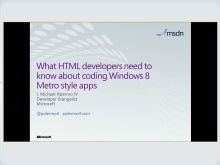 If you are experienced with .NET or Silverlight and are already familiar with XAML, this session will teach you everything you need to know to create a Metro style app for Windows 8. This session will cover updates to familiar features and explore concepts that are new for Windows 8. We'll talk about building reusable Windows Runtime Components in C#, Async programming in Windows 8 and both the Visual Studio and Expression designers. 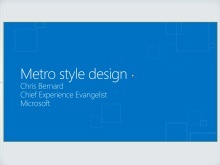 This session will show you how to turn your XAML skills into money-making Metro style apps.